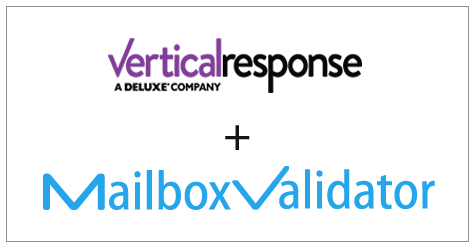 MailboxValidator’s integration with VerticalResponse provides users simplest way to import their email list into MailboxValidator for validation and then return the results back to VerticalResponse. This article will demonstrate how to use this integration. First of all, you will need to have an account on both MailboxValidator and VerticalResponse. So go ahead to register a new account at the sign up page if you don’t have one yet. You will also need to prepare and upload your email list to VerticalResponse. Once your email list in Vertical Response is ready, login to your MailboxValidator dashboard and select “Import VerticalResponse Data” from the “Integration” dropdown menu. 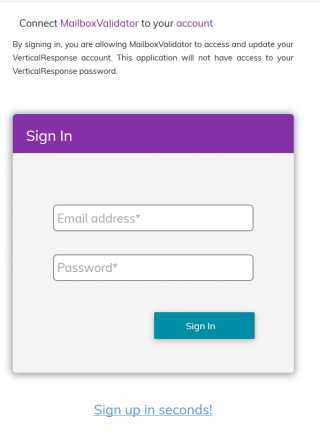 If you have not used this integration before, a message “You will be redirected to VerticalResponse login page in a few seconds…” will be shown and you will be redirected to VerticalResponse’s login page. Login with your VerticalResponse account to give MailboxValidator access to your email list. After you have logged in successfully, you should see a message like “You have successfully logged in to VerticalResponse. You may proceed to import VerticalResponse lists for validations.”. Click on the “Go to import page.” to see your email list on VerticalResponse. Now, choose the email list that you wish to import, and click on “Import Selected List & Validate”. You should see a success message like “Your list will be processed and VerticalResponse will be updated automatically.” on the page. 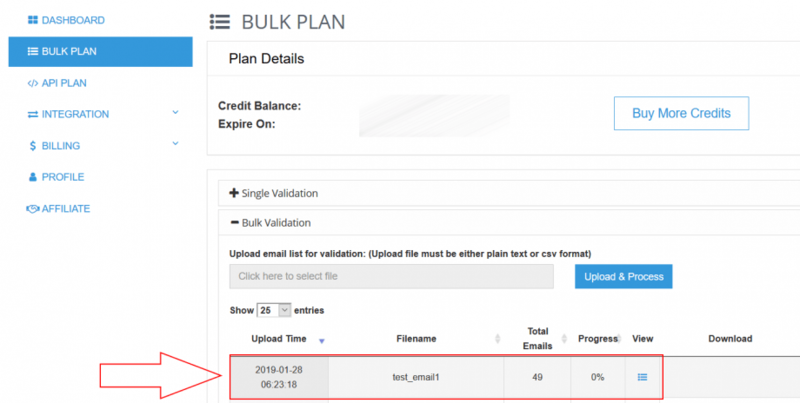 Go to the Bulk Plan page and click on Bulk Validation, you can see the progress. 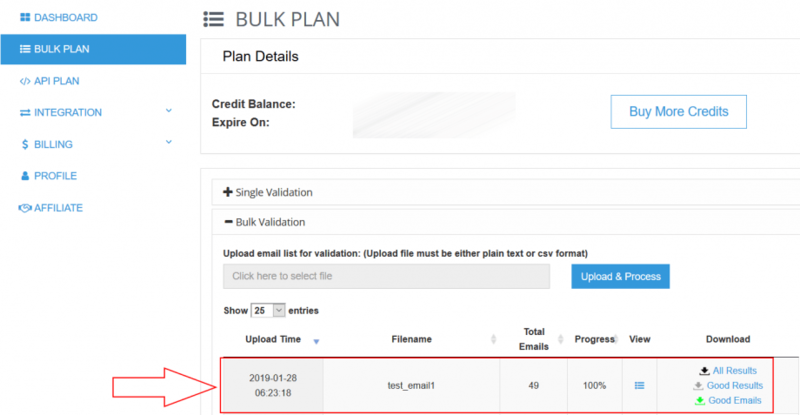 Please note that the validation process may not start immediately as all bulk validation tasks are put into a queue and processed in the order that they were queued up. Rest assured, your validations will be processed when you have reached your turn in the queue. Once the progress showed 100%, you’ve completed validation and the analyzed result will be updated at VerticalResponse. You can download the result straight from the MailboxValidator dashboard or go back to your VerticalResponse account. You will also be notified via email when the validation is done. 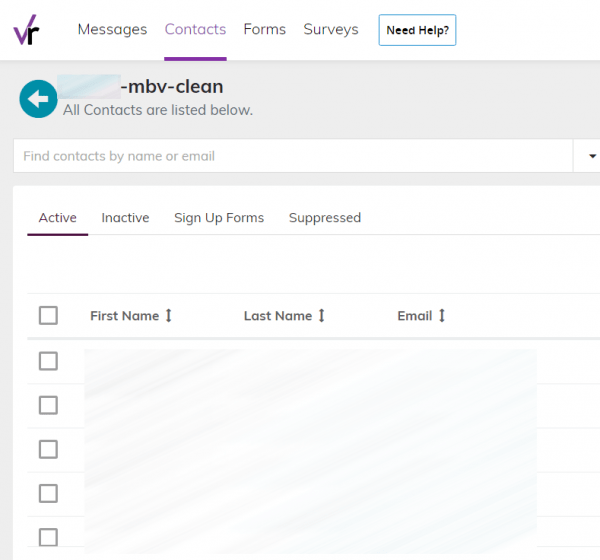 Don’t be surprised to see a new list been created as it is created intentionally to keep only the valid emails with the related contact details.